FIT is happy to be part of the New York Times Readership program one benefit provides digital access to the New York Times from September till June with ‘Academic Pass’. This benefit is available to all FIT Students, Staff, and Faculty. 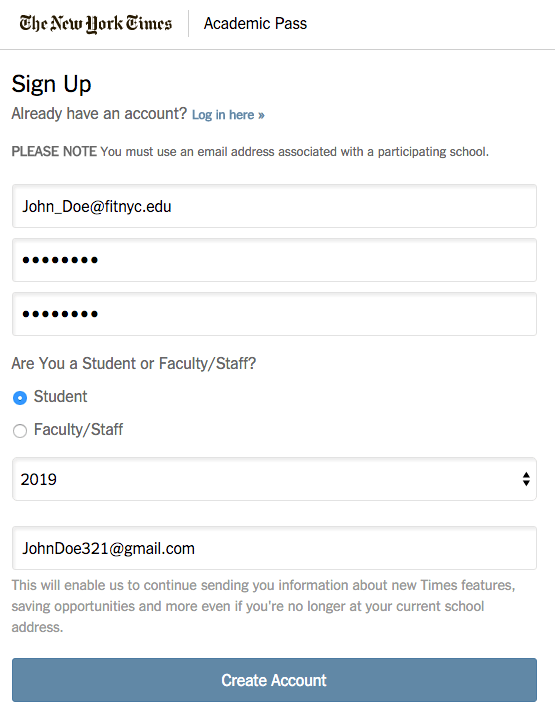 The Academic Pass provides you with full access to NYTime.com and most features of the NYTimes app (example NY Times Crossword not included). On March 28, 2011, the New York Times began charging for access to its Web edition. Most people, except those with subscriptions, are capped at viewing 10 articles each month before charges take effect. The Academic Pass gives you access to content without the cap. 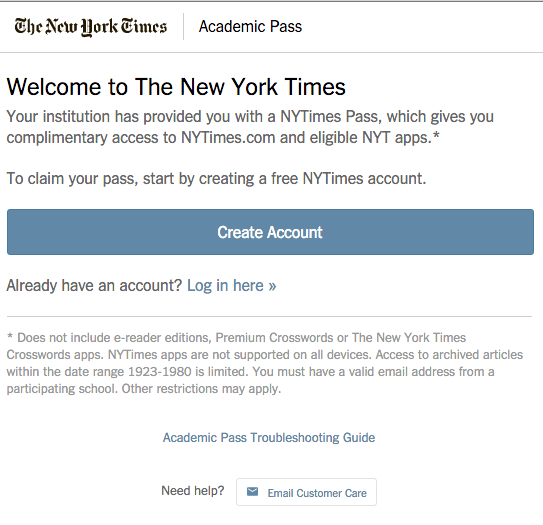 Each individual claiming a NYTimes.com Academic Pass will have unlimited access to NYTimes.com and unlimited access to the NYTimes apps for the digital package for 24 hours from the time of claiming the pass. The apps are free to download. Once your 24 hours expires, you will need to activate a new Academic Pass by following the Returning User instructions. 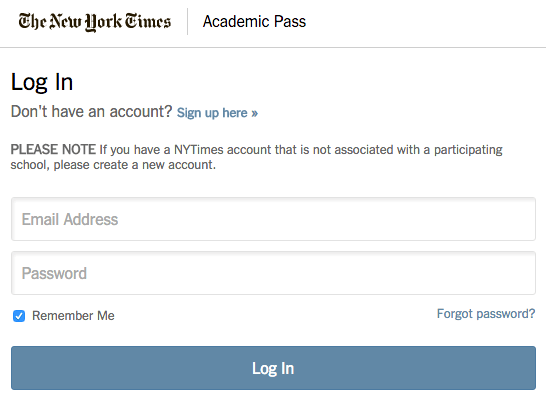 How do I claim your NYTimes.com Academic Pass? First-time users must first activate their Academic Pass. All you need is to know your FIT Username, FIT Password, and FIT email address to get started. Please follow the instructions below for First-time Users. If you have already activated your Academic Pass, please follow the instructions for Returning Users. 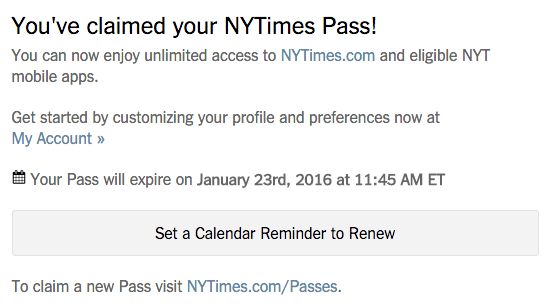 There are many ways to access New York Times articles and other content. For more information on additional methods to view the New York Times, please view the FIT Library’s Research Guide New York Times: How to access the NYT in different formats. – Password: You will be creating a new password (it does NOT need to be the same as FIT) and will not change when you change your FIT Password. Please go to the Returning User instructions. 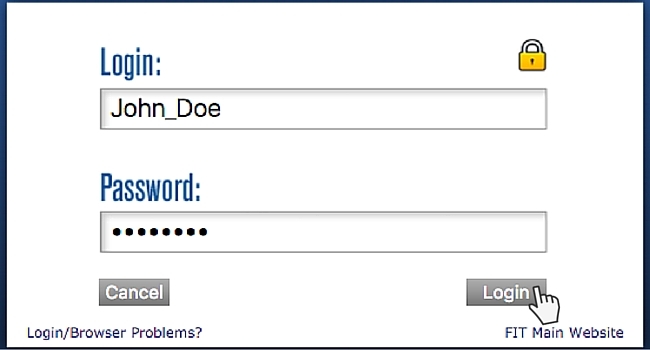 If you forgot your password, click on the “Forgot Password” link. Your Academic Pass expires after 24 hours. After your Academic Pass expires you will need to complete the Returning User instructions. After your Academic Pass expires you will need to complete the Returning User instructions again.